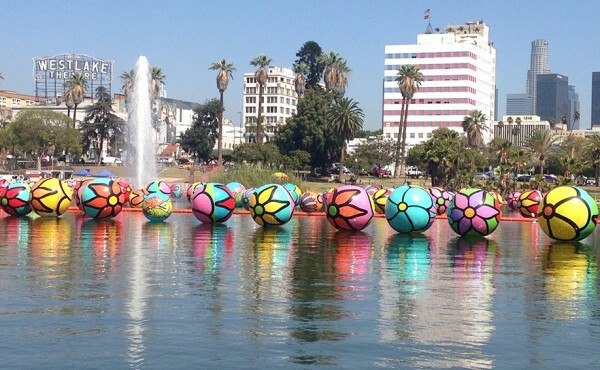 Upon its completion, Portraits of Hope’s vibrant installation, “Spheres at MacArthur Park” will be the largest public art exhibition Los Angeles has ever seen. 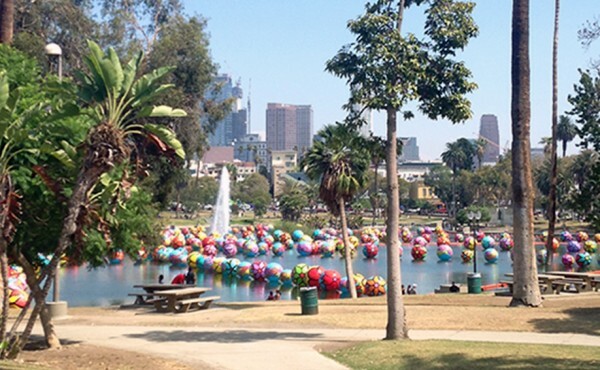 It’s such a treat to see this explosion of color come to life right here in our own backyard in MacArthur Park, the home of Levitt Pavilion Los Angeles. Spearheaded by brothers Ed and Bernie Massey, the founders and creative visionaries behind Portraits of Hope, this project beautifully illustrates their nonprofit’s mission to use public artwork as a vehicle for creative therapy. 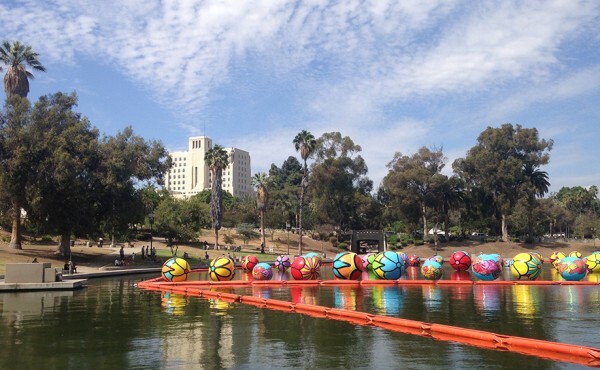 Upon completion, approximately 2,500 spheres will float upon the 8-acre surface of MacArthur Park Lake. 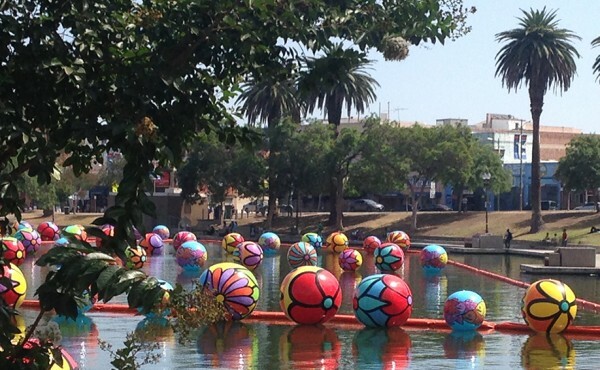 New floating spheres will be circulated into the mix every 5 days to add variation to the floating installation. 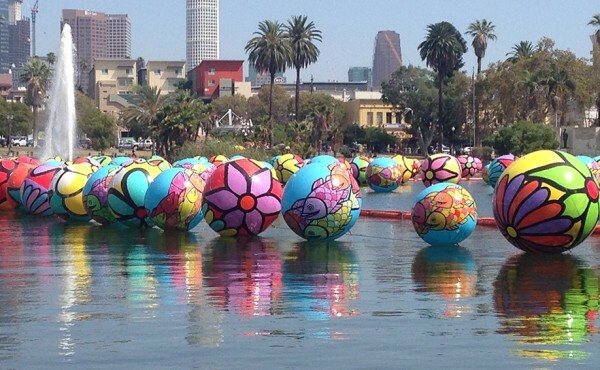 Painting enough spheres to accommodate the lake’s expansive surface took the work of a small creative army! Approximately 10,000 volunteers ranging from ages 5 to 91 have participated in the creation of this project thus far, hailing from a wide array of neighborhoods across the Southland—from those near Portrait’s of Hope’s community painting studios in El Segundo to those surrounding MacArthur Park. Some volunteers brought their painting skills all the way from Japan! I had the good fortune of participating in one of Portrait of Hope’s volunteer painting sessions earlier this month. 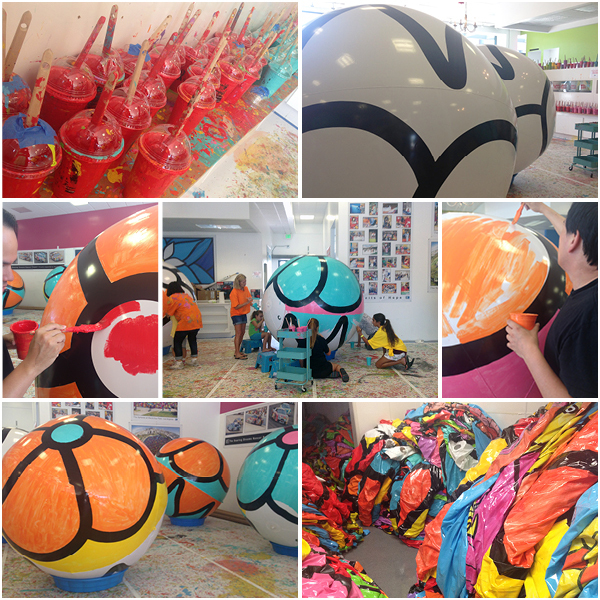 Walking into Portrait of Hope’s bright and colorful El Segundo painting studio, I was immediately struck by the size of the inflated spheres. Ranging between 4- to 6-feet in diameter, many towered over me and I was thankful for the provided stepstools. 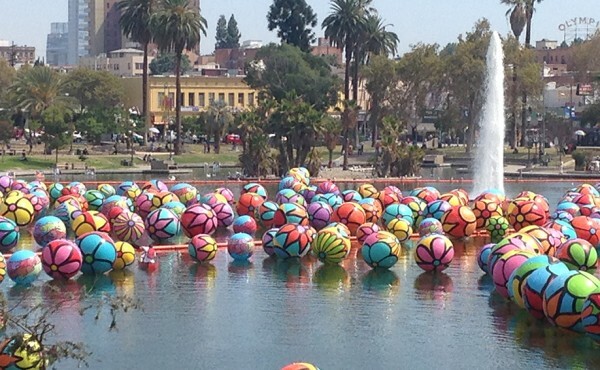 Three to four volunteers worked together to cover the surface of each sphere with brightly colored waterproof (and environmentally safe) paint. Community members of all ages and backgrounds worked side by side, swaying to the festive music playing in the background and laughing about how surprisingly challenging it was to paint a perfectly straight line on a 3-dimensional canvas. 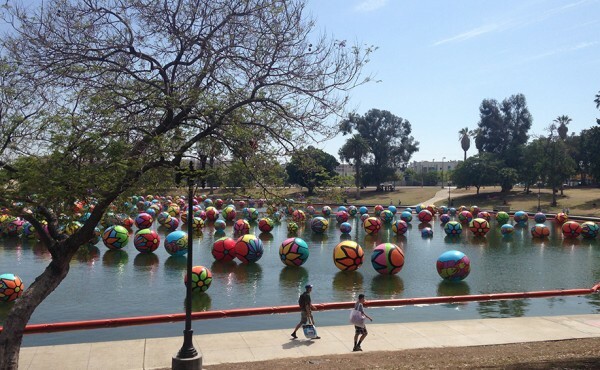 One by one, plain white spheres with black guiding lines were transformed into shiny, candy-colored pieces of art. The experience was fun and gratifying. I wasn’t surprised to hear one young volunteer asking her mother if they could come back and do this again next year. In addition to the strong community turn out, Portraits of Hope also worked with numerous local hospitals and schools for the MacArthur Lake project, extending the opportunity to participate to youth who might otherwise not have been able to do so. At the volunteer paint session Ed Massey explained that he grew up near MacArthur Park and remembers when MacArthur Park Lake used to be a paddleboat-filled destination in the center of L.A. 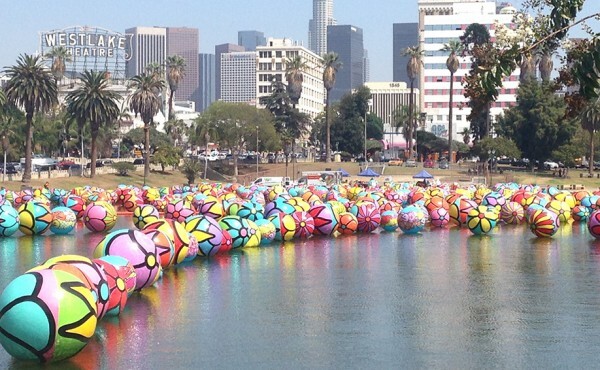 When contemplating the idea of a floating mid-city installation, he explored urban lakes across the globe—only to find the best fit in his hometown. 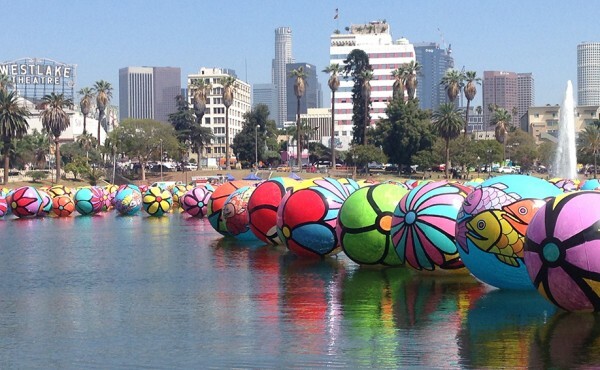 In MacArthur Park, he found an urban lake with a warm enough climate to keep inflatable spheres afloat and a legacy that deserved to be celebrated. 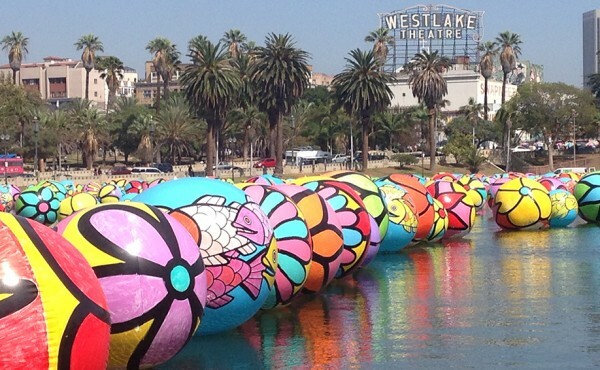 He hopes that this project will increase the visibility of this former L.A. gem, and continue to add momentum to the revitalization of the densely populated area surrounding the lake. 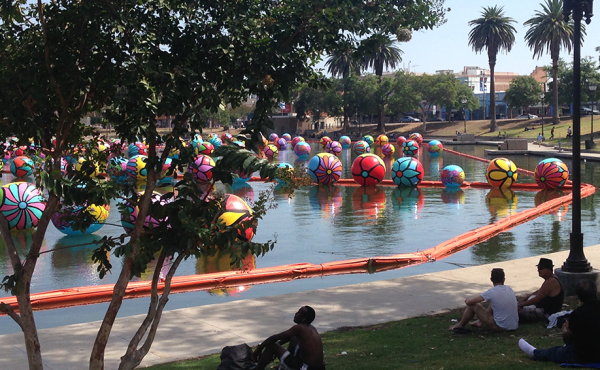 It’s fun: How often do you get to see an urban lake filled with larger than life candy-colored orbs? 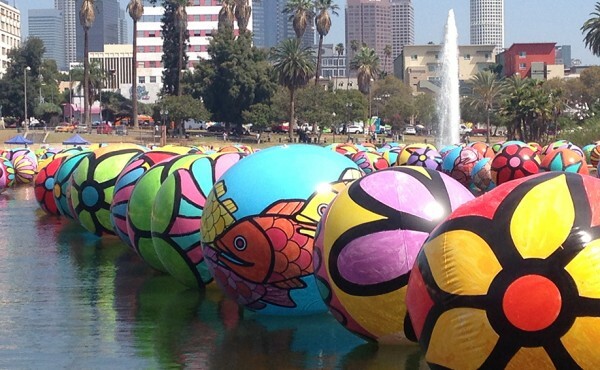 It’s accessible: Like Levitt concerts, this installation is free and open to the public. It celebrates a place, helping visitors see it in a new light: When visiting the installation this past Wednesday, I was surrounded by children and adults admiring the lake’s new appearance. 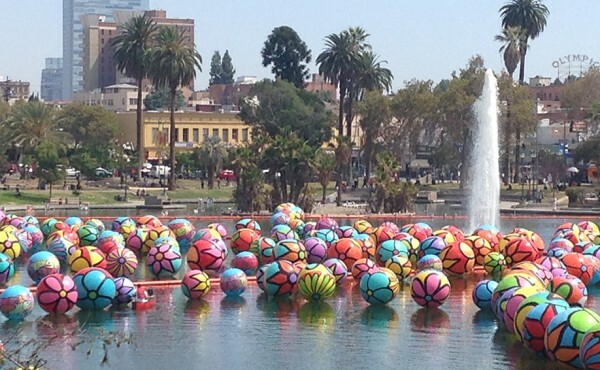 One motorcyclist pulled over to take an impromptu picture of the colorful installation before continuing on her way. At its best art can inspire a change of perception—whether you are discovering a new type of music you didn’t know you liked or pausing to appreciate a public space you pass by everyday. It empowers: Helping to create such a highly visible public art project gives participants a great sense of pride and accomplishment. It brings people together: It took thousands of volunteers from all walks of life to bring this project to life including students, patients at local hospitals and all types of artists—including the musicians from the Leftover Cuties who will be performing at Levitt Pasadena next week! Check out the video below to see the Leftover Cuties at a recent paint session. 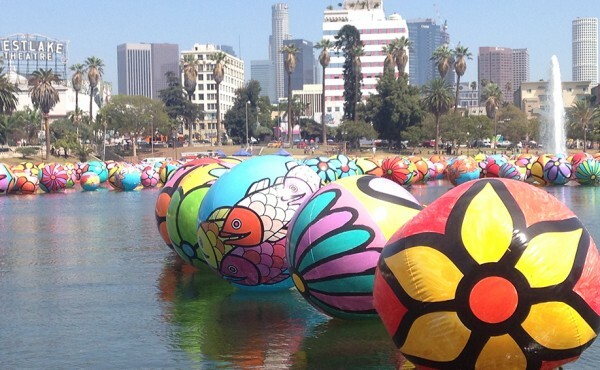 To quote L.A. Mayor Eric Garcetti, “This project involves everything that’s good about Los Angeles-great weather, open space, creativity and social conscience.” So, Angelenos, next time you make your way over to MacArthur Park to enjoy some free, live music at Levitt L.A., be sure to stop by the lake for a splash of color you will not soon forget! The installation remains on view for the next month. After that the spheres will be donated to schools, hospitals and social service organizations, where they will continue to brighten spaces and faces. Volunteers are still needed to complete the final phases of the project’s installation. For information about volunteering visit Portrait of Hope’s Facebook page. Muy coloridas las pelotitas, PERO alguien se puso a pensar en el impacto que tendran con los patitos, palomas, peces, gansos, gaviotas etc ect …animalitos que viven en este lugar?? De por si ya esta muy contaminado imaginence la cantidad de quimicos contaminantes que desechan estas pinche pelototas, con el plastico y la pintura, y todo el calor que esta hacienda en esta ZOna, si quieren que se vea bonito el Parque, pues hay que limpiarlo, conseguir un lugar digno para todas las personas sin hogar que se an venido a vivir aqui, por renovar el centro de Los Angeles, Pinten de colores las bancas, tiene un sin fin de murales alrededor, por que fregar A LOS POBRES ANIMALES!!!!!!! QUE INCONCIENCIA………………. Thank you for your comment! 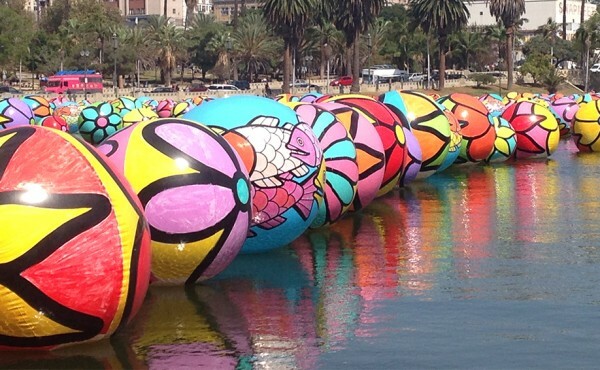 It’s our understanding that the folks at Project of Hope are taking the necessary precautions to ensure that their colorful project doesn’t leave a negative impact on MacArthur Park’s environment. 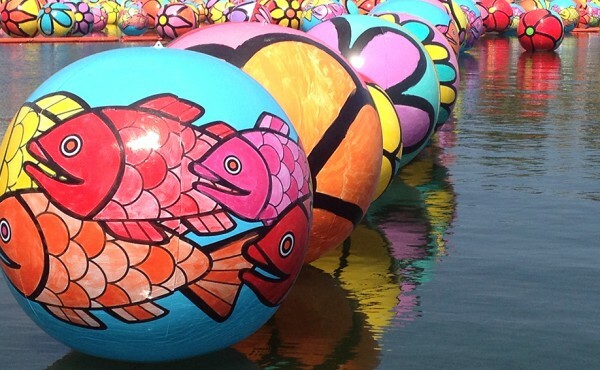 Each sphere was painted using environmentally safe, waterproof paint—the same paint used on many buoys today. 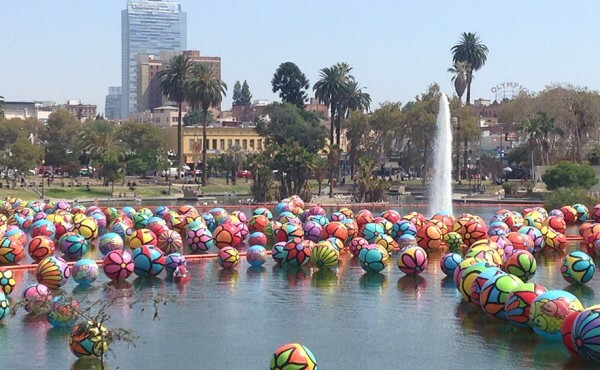 We were also informed that months of underwater testing occurred prior to placing any spheres into the lake and that the bottom of each sphere was left unpainted. For any additional questions, please contact poh@portraitsofhope.org.